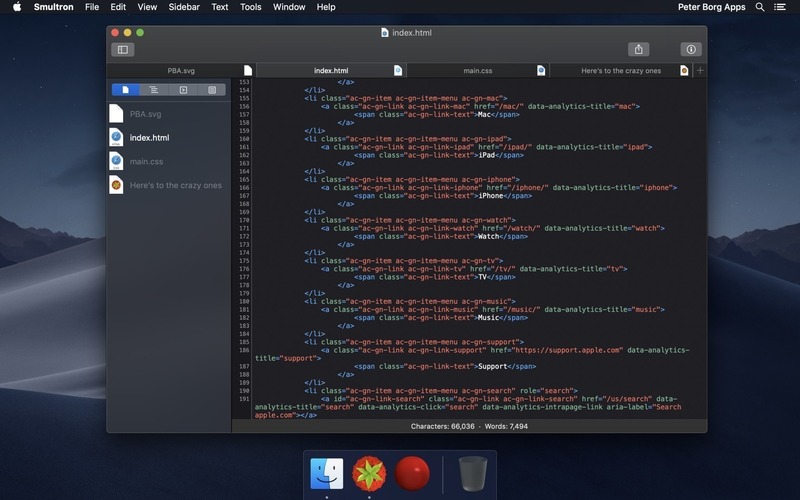 Smultron 10.1.4 – Easy-to-use, powerful text editor. Smultron 10 is an elegant and powerful text editor that is easy to use. You can use Smultron 10 to create or edit any text document. Everything from a web page, a note or a script to any single piece of text or code. Smultron 10 is very easy to use, it is fast and uses powerful technologies like auto save. It helps you to do what you want to do without getting in your way. So you can save time and get things done. Use Smultron 10 for all your text needs..
Next story ActiveDock 1.04 – Application launcher and alternative, customizable dock. Previous story Particle Designer 2.9 – Particle simulation software for Mac. Quiver 3.2 – The programmer’s notebook. Smultron 11.0.2 – Easy-to-use, powerful text editor. TextMate 2.0.rc.17 – Code/markup editor with many features (beta).